We wanted to better align the name with the program’s innovative approach to delivering a personalized sequence of instructional content to every student. This award-winning, research-backed program ensures all students have the foundation they need to succeed in math. Another critical benefit is that it now better delivers research-backed content – what you need when you need it. 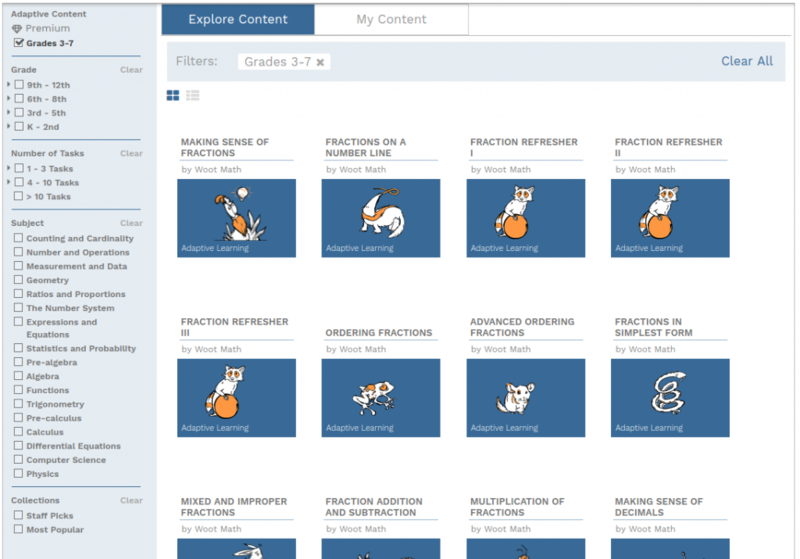 Regardless if you need Adaptive Learning or rich math tasks for an exit ticket, you can now find and manage your content more quickly and easily! Adaptive Learning can now be assigned by unit (or book). The new assignments are more like traditional assignments, you can specify an end date, view progress towards completion, etc. And if you are using Google Classroom, those assignments are now also available there. Students also have a new student dashboard which gives them agency over their learning. They can choose which assignment to work on, view their data, updates, and your feedback. How do I use the new Adaptive Learning? On your teacher dashboard, you’ll now see a Content tab. 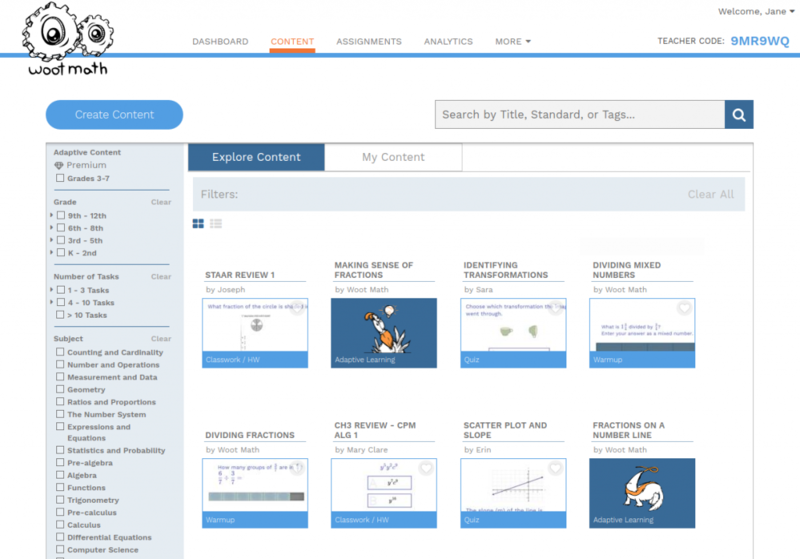 Under the Content tab, Explore Content is where you can browse all of the content available for you to use, which includes both Adaptive Learning as well as formative assessments (quizzes, exit tickets, warmups, and more). Make an assignment to your students, and that assignment will appear on the student dashboard for them to complete. The Adaptive Learning units are indicated in blue with Adaptive Learning as the tag (show here are Making Sense of Fractions and Fractions on a Number Line). To view all of the Adaptive Learning units, you can also click on the Adaptive Content filter. You can easily assign these units to your students by hovering over the desired unit and selecting Assign. If you are on the free tier, you get two units for free that you can assign for your students. Once you unlock a unit, then you can assign it. If you are a premium subscriber, then you have access to all of the Adaptive Learning content. To learn more about becoming a premium subscriber, please visit the pricing page. As your students are working through their assignments, you receive real-time reporting on their progress. New Adaptive Learning content will continue to open as they complete their current assignment. You can view their progress from the Assignments and Analytics tabs. An interactive PD is available that will walk you through various aspects of using Woot Math in your classroom. For additional information, there is also a Teacher User Guide, or contact us with any questions, we are always happy to help! PrevPreviousHow do I selectively import Google Classroom classes?